Me with my buddy, Frank, one of the goodest of very good boys. A friend of mine is very sadly looking for a new home for Frank, a character you’ve heard mentioned several times on this blog. I love this horse to bits, and whoever winds up with him will be fortunate indeed. Frank is a real character, in a good way. He is loaded with personality, and is a friendly, funny boy without a mean bone in his body. I’ve known him for four years or so. During that time his owner and I have gone on trail rides together, gone to some shows, and in general, have had a great time. 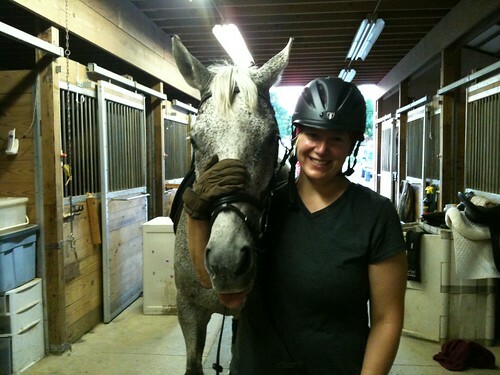 She’s also loaned me Frank during those times I’ve been horseless, or when my confidence has needed a boost. Frank, for me, is kind of like a security blanket. Frank has the dreamiest canter. Uphill, rolling, lovely. Frankie is an 18 year old flea-bitten grey TB standing 16h. He’s been trained to second level in dressage, and is an excellent teacher. He’s sound but does require supplements because, like pretty much any 18 year old horse, he’s got some creaky, arthritic joints. Presently, he’s been helping one gal rebuild her confidence, and is also doing up-down lessons on a longe line with a little girl. If you’re looking for a sweet, handsome horse to learn dressage on, or just enjoy riding, consider Frank. 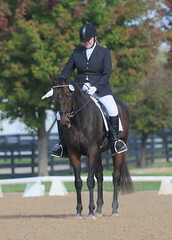 His ad, which includes details on contacting is owner, is here: Dressage schoolmaster.